The Gregoriou Monastery (Greek: Γρηγορίου) is situated on the southwest side of the Athos Peninsula in northern Greece, between the monasteries of Dionysiou and Simonopetra. Gregoriou originally was dedicated to the St. Nicholas but later was renamed in honor of its founder, Gregory. It is ranked seventeenth in the hierarchical order of the twenty monasteries located on the Mount Athos peninsula. 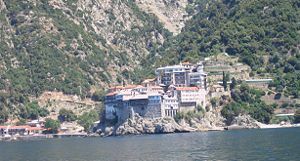 Gregoriou is reputed to be one of the most well-organized and strict coenobitic monasteries on the Mount Athos peninsula. The monastery was founded by St. Gregory of Mount Athos (Younger) in the fourteenth century when he came to Mount Athos to pursue asceticism. Over the next several centuries little is known about the monastery other than that it suffered serious damage from raiders and in 1761 from a fire. Barsky, an eighteenth century Russian visitor, observed that restoration work had been done in 1500, and also noted that the fire of 1761 had destroyed many of the heirlooms and documents then held by the monastery. Additional damage was incurred during the Greek revolution against the Turkish sultan in 1821. Restoration work at Gregoriou monastery that had been accomplished over the years was supported by various benefactors including the princes of Moldavia, Phanariotes, archbishops of Hungro-Wallachia. Even a few Turkish sultans provided aid. The katholikon, dedicated to St. Nicholas, was built in 1768 and follows the Athonite style. The frescos in the katholikon were done in 1779 by the monks Gabriel and Gregory from Kastoria. The frescos present scenes from the Old Testement. A narthex was added to the katholikon in 1846, under the direction of Neofitos, the abbot. The monastery also contains ten chapels as well as four cells in the administrative center Karyes. As noted above much of the older treasures of the monastery were lost in the fires of 1761 and the warfare of 1821. Those treasures that the monastery now holds are kept in the katholikon. These treasures include icons of the Virgin Galatotrophousa and Virgin Pantanassa, relics of saints (the relics of St, Gregory were believed taken by some Serbian monks), and various liturgical objects. The monastery library holds 297 manuscripts, many other documents, and some 4,000 books. These include the only existing manuscript copy of the Shepherd of Hermas a work that dates back to the first century. This page was last edited on April 30, 2016, at 17:57. This page has been accessed 24,420 times.